Babblings of a Mommy: Vaseline Total Moisture Review & Prize Pack Giveaway!!! Vaseline Total Moisture Review & Prize Pack Giveaway!!! Vaseline is a company that needs no introduction, it's been a household product for over 100 years and just keeps getting better! Their new Vaseline Total Moisture lotion is designed to solve a problem that many women have run into – feeling they have to make a tradeoff between a lotion that feels good, and one that works well. The new lotion is non-greasy, fast absorbing and offers Stratys-3 TM multi-layer moisture complex, infusing moisture at the top, core, and deep down layers of skin. What I like about it was the consistency - not too thick, not too watery. It also smells nice & fresh and is not overpowering at all. I tried it when I noticed that my hands were extremely dry and immediately noticed a difference. It made my hands nice and soft and lasted until I went to bed. Vaseline® Total Moisture® Aloe Fresh – Light feeling lotion for healthy fresh skin. Vaseline® Total Moisture® Cocoa Radiant™ – Rich feeling lotion for healthy glowing skin. And I'm giving away ALL THREE to one lucky reader!! Be sure to check out my facebook page to enter to win! Giveaway ends 5/25/12. In the meantime, check out these moisturizing tips from Vaseline! • Vaseline® Total Moisture® – Clean feeling lotion for healthy soft skin. • Vaseline® Aloe Fresh – Light feeling lotion for healthy fresh skin. 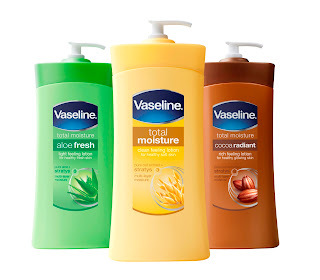 • Vaseline® Cocoa Radiant™ – Rich feeling lotion for healthy glowing skin. • Oat is known for its anti-inflammatory and anti-irritant properties. It is an effective moisturizer, which can soothe dry skin. • Aloe is a known effective skin conditioning agent, which is also known for its soothing properties. It can help hydrate skin, leaving it feeling refreshed. • Cocoa butter is a known effective emollient. It helps hydrate the skin and lock in that moisture to keep skin soft, smooth and glowing. Have a great week. Greetings from Romania.